The British and French Empires at their greatest territorial extents (British in red, French in blue). AT THE HEIGHT OF EMPIRE, nearly thirty percent of the peoples of the world and more than a third of its surface area were controlled by only two nations. The United Kingdom of Great Britain and Northern Ireland ruled a quarter of the earth’s population and a quarter of its landmass. As the saying went, “the sun never sets on the British Empire,” and indeed, for nearly two hundred years it never did. By far the most expansive and successful empire in history, Britain consolidated and expanded its holdings through wars of conquest and a military might unmatched by any other power on the planet. Britain was not the only globe-spanning empire, though. France controlled much of Africa (to an even greater extent than Britain), as well as holdings in Indochina, the Middle East, and the Caribbean. French and British Empires alike were kept in power by the violent repression of rebellions, mutinies, and ‘uprisings’. In large part, however, the armies participating in the repression were not composed of all-white formations. The sheer size and scope of the global empires required the imperial powers to recruit heavily from among local populations, and the manpower demands of the two world wars necessitated their deployment to the Western Front. In many cases, the colonial troops performed even better than their European counterparts. The French Tirailleurs Sénégalaise in particular enjoyed a widespread reputation after the war as both peaceful and respected occupation forces, and as daring and highly successful soldiers. Many other French colonial troops garnered equal praise. The British ANZAC and colonial troops also earned warm words for their bravery (Erwin Rommel was quoted as saying, “If I had to take Hell, I would use the Australians to take it and the New Zealanders to hold it”). It is no exaggeration to state that both French and British Empires alike were founded on the backs of the native populations. But this went beyond local labor forces and resource extraction. The majority of the two empires’ military might overseas was provided by native troops, who not only played a crucial role in expanding and holding imperial possessions, but were equally willing and capable of defending their respective metropoles during the two world wars. V.G. Kiernan writes of the surprising number of volunteers for military service throughout Africa and Asia, and the almost total absence of conscription in India. As he says, “Afro-Asia was taught to conquer itself for foreign pay, most of it taken out of Afro-Asian pockets.” Put simply, the imperial armies of France and Britain were the means by which the empires existed, and even more importantly, are the reason for the very existence of Britain and France themselves. The means by which empires of the eighteenth through twentieth centuries maintained, enforced, and expanded their rule was to a large degree military in nature. The British Empire was primarily a maritime one, and so the land armies were never as large as that of the French; London preferred to avoid military subjugation in favor of civil administration. The main difference between British and French colonial rule, however, is best characterized as direct versus indirect rule. The British model of indirect rule essentially incorporated indigenous governmental structure and bureaucracy into the entire framework of the Empire, whereas the French model was based more on a direct rule enforced by administrators. Neither of these was particularly rigid in practice; when necessary, the British had no qualms resorting to direct rule, and the French were equally willing to allow degrees of self-governance when the machinery of government grew too unwieldy to direct from the metropole. Nevertheless, the British were certainly not averse to quelling rebellion and dissent by force where necessary. The Sepoy Rebellion of 1857, the Bambatha Rebellion in 1906, and at least twenty-five others between 1800 and 1950 were suppressed, often with a vicious brutality, but even that did not compare to the tactics employed by the French. From the foundation of the French Empire in Algeria in 1830, to its demise (also in Algeria) in 1958, French rule in the colonies (and the acquisition of those colonies) was marked by cruelty and violence. 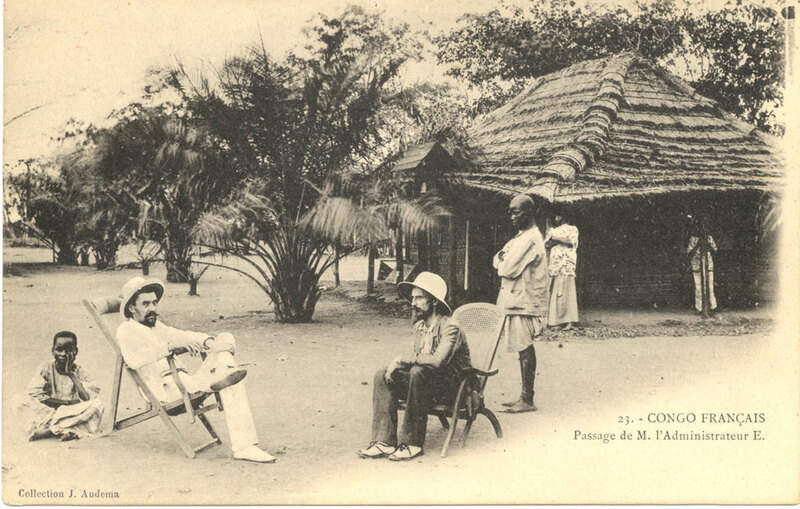 In Côte d’Ivoire, the process of ‘pacification’ took place beginning in 1909, when the French governor, Gabriel Angoulvant, began burning villages and collecting fines of hundreds of thousands of francs. By 1908, the province was in full revolt, and Angoulvant put it down brutally with 1,400 additional reinforcements. The heads of rebels adorned pikes outside the railroad stations. The levels of brutality in French Africa rivaled that of the Belgian King Leopold’s Congo Free State, at least in the rubber-bearing areas. As Adam Hochschild observes, “thousands of refugees who had fled across the Congo River to escape Leopold’s regime eventually fled back to escape the French.” One can only imagine the motive for returning, but either the French regimes were even worse, or it was decided that in the face of suffering either way, one might as well suffer in their own home. The chicotte as used in the Congo. Hochschild explicitly compares the devolution of complicity as practiced by the French to that of the Nazis during the Holocaust, when the Einsatzgruppen would recruit collaborators from the occupied territories (such as the Ukrainian Hiwis) to ‘do their dirty work’. By making the native population equally in maintaining French rule, it was possible to sit back and watch the empire police itself. The bulk of chicotte blows were inflicted by Africans on the bodies of other Africans …. It created a class of foreman from among the conquered, like the kapos in the Nazi concentration camps and the predurki, or trusties, in the Soviet gulag. Just as terrorizing people is part of conquest, so is forcing someone else to administer the terror. The subjects of the French Empire did not just carry out the colonial policies that France demanded. A great deal served in the French Army during both world wars, in Europe and Africa alike. During World War I, many prominent Africans were filled with a “patriotic zeal for conquest,” though this zeal may have been based more on a desire for full citizenship than any concept of loyalty to their colonial rulers. Turning south, one finds a similar (though not exact) situation in British Africa. Beginning with the acquisition of the Cape Colony in 1806, Britain moved quickly, and so even before the ‘official’ start of the “Scramble for Africa” at the Berlin Conference in 1884, Egypt, Gambia, Gold Coast, Natal, and the Transvaal were all under British control. Is it not necessary, to conclude that…our…territories…were given to us, not merely that we might draw an annual profit from them, but that we might diffuse among their inhabitants, long sunk in darkness, vice, and misery, the light and the benign influences of Truth…? After all, if one were to earn their fortune, why not help the poor, ignorant inhabitants of their personal treasure chest? India, long considered the ‘crown jewel’ of the British Empire, stands as a singular example of the commercial nature of imperial expansion. Originally founded as a series of trading posts along the coast of the subcontinent by the East India Company, the urban centers of Bombay, Madras, and Bengal were soon thriving metropolises under British rule. 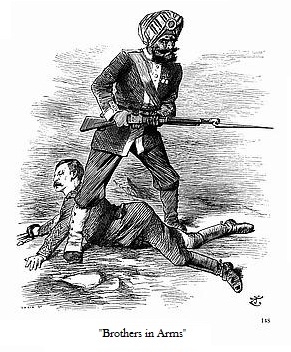 Between 1612 and 1857, the East India Company expanded its presence inland and to points east and west, with “war after war extend[ing] British rule ever further beyond Bengal – against the Marathas, against Mysore, against the Sikhs in the Punjab.” The majority of the fighting in these wars was undertaken by Indians in British service. The recently conquered became the enthusiastic conquerors of the next day, such as the Sikhs after the conquest of the Punjab. The bulk of the East India Company’s military strength lay in its sepoy regiments. Numbering roughly 1,000 men per unit and led by European officers, the sepoys formed eighty percent of the Indian Army. Unlike their white counterparts, however, the sepoys were not the “dregs of society.” Many came from the higher Brahmin and Rajput castes and sub-castes, and the vast majority were from the traditional warrior castes, the “martial races” from the northern reaches of the Ganges Valley; from Bihar, the kingdom of Oudh, and even farther afield the “very respectable troops” of sepoys were recruited. The British tended to romanticize them to some extent, and found the closest relative (in their experience) to be that of the sturdy yeoman of the Scottish highlands. The tenant-landlord, farming relationships were easily translated into an Indian context, and stressed the landholding characteristics of one willing to defend one’s home. These hardy sepoys did the primary work of building the British Empire in India, conquering nation after nation. How long would it have taken to subjugate and pacify Burma if we had not been able to get the help of the fighting-men from India, and what would have been the cost in men and money? In manpower, it would have been at least 15,000 troops—far too much for Parliament to stomach at the time. By guaranteeing the use of Indian troops, and therefore reducing the overall number of British soldiers required, the East India Company was able to present a far more palatable budget proposal. Despite the general appreciation for the quality of the troops in the Indian Army, the race-based attitudes prevailed. Lord Dalhousie, then Governor-General of India, observed on the eve of the Sepoy Mutiny that, “the sepoy is a child in simplicity and biddableness, if you make him understand his orders, if you treat him justly, and don’t pet him overmuch” [emphasis in original]. The policy of the Indian Army’s British commanders was to let ‘natives’ serve as NCOs, and in a few special cases, as junior subalterns. Disagreeable as this was, it was certainly no cause for a mutiny. However, it was merely one more factor in a long series of discrimination and persecution (both real and exaggerated), which almost ended the British hold on India permanently. ‘By far the most expansive and successful Empire in history’? Grahambo I won’t disagree with you on expansive, but successful? The British Empire didn’t truly begin until the late 1700s (seeing as they had yet to pacify the whole of the main island until after 1746) and soon after lost a large chunk of their American holdings. If we agree that the British Empire did not truly begin until the late 18th century, (I’m more prone to say the British Empire wasn’t a stable entity until after Waterloo) then that would give it a solid 200 year span (1746-1946) before its collapse at the end of the Second World War. Shouldn’t the case then be made for the like of Rome or Egpyt? The Roman Republic stood from 509 BC-27BC when the Civil Wars between Caesar and Pompey Magnus broke out. It then became the Roman Empire stretching from 27BC-476AD, not including the survival of the Eastern Empire in Constantinople until being sacked by Christian Crusaders in 1453. Either way you shake it Rome ruled for 500 years, or nearly a millennium. Egypt had an even more impressive run with three periods of kingdoms (Old, Middle and New) lasting for about 3 millennium. Also in terms of expansion can we not get a shout-out at least to the Mongols? ‘By far the most expansive and successful Empire in history’? Grahambo I won’t disagree with you on expansive, but successful? The British Empire didn’t truly begin until the late 1700s (seeing as they had yet to pacify the whole of the main island until after 1746) and soon after lost a large chunk of their American holdings. If we agree that the British Empire did not truly begin until the late 18th century, (I’m more prone to say the British Empire wasn’t a stable entity until after Waterloo) then that would give it a solid 200 year span (1746-1946) before its collapse at the end of the Second World War. Shouldn’t the case then be made for the like of Rome or Egypt? The Roman Republic stood from 509 BC-27BC when the Civil Wars between Caesar and Pompey Magnus broke out. It then became the Roman Empire stretching from 27BC-476AD, not including the survival of the Eastern Empire in Constantinople until being sacked by Christian Crusaders in 1453. Either way you shake it Rome ruled for 500 years, or nearly a millennium. Egypt had an even more impressive run with three periods of kingdoms (Old, Middle and New) lasting for about 3 millennium. Also in terms of expansion can we not get a shout-out at least to the Mongols?